The regiment was attached to the Third Division of the Sixth Army Corps. It reached the actual scene of action on the battlefield about 2 o'clock in the afternoon of the 2d of July, 1863, after a forced march of thirty-two miles. We were moved from one position to another between that time until 4:30 p. m., when we were directed to take position on the left of "Rocky Hill". This was the extreme left of our line. The regiment had barely gone into position, when all of our troops in front, except two regiments of the Pennsylvania Reserves, were driven back and up the hill, passing through our lines. At that moment we received the order to advance to the support of the two regiments of the Pennsylvania Reserves. The command received, the Sixty-second dashed forward with eager enthusiasm, closed up with the Pennsylvania troops, and immediately opened fire upon the advancing enemy. After delivering several volleys, we charged the enemy's columns, broke them, drove them in disorder down the hill, and captured two light twelve-pounder guns, which had been lost by the Fifth Corps earlier in the day. Reaching the front of "Rocky Hill" the regiment advanced about 100 yards, and halting, remained in this position until the morning of the 3d of July. About 10 o'clock that morning the enemy advanced their column in reconnaissance. We promptly met the advance, and by a well-directed fire drove it back. At 2 o'clock p.m. our line and the hills beyond were viciously shelled by the enemy, but without any advance of their troops. At 6 o'clock we were moved forward to the left in support of a reconnaissance, under General Crawford. Our regiment was actively engaged in this movement, and advanced to the extreme left of our line, where we met some of the enemy's troops, which we drove for half a mile or more, capturing many prisoners. We remained in our advanced position until 9 o'clock on the morning of the Fourth of July, when we were ordered to support a reconnaissance made to the front by General Sykes. This was accomplished without loss, and we occupied the position thus gained for the rest of the day. Col. David J. Nevin, of our regiment, who commanded the brigade to which the Sixty-second was attached, in his report of the action of his brigade, says: "The extraordinary endurance evinced by my command and their daring bravery at the turning point of the battle deserve larger mention than the limit of the report will allow. Never did troops advance upon the enemies of their country with more cheerfulness and spirit". The bronze tablet on the monument (to the Regiment at Gettysburg) is illustrative of the moment when, the Sixty-second New York drove the advancing columns of the enemy down "Little Round Top" and captured the two twelve-pounder guns of the Fifth Corps above mentioned. The Sixty-second Regiment was organized and mustered into the service of the United States at the City of New York on the 30th day of June, 1861, under Col. J. Lafayette Riker, who continued in its command until the afternoon of the 3Oth day of May, 1862, when he was killed while gallantly leading his regiment in a successful charge to resist the advance of the enemy at Fair Oaks Station, Va. The regiment was 1,000 strong when it reached the seat of war. After the death of Colonel Riker, it was commanded by Col. David J. Nevin, and subsequently, by Col. Theodore B. Hamilton*, a son of the late surgeon general of the army. The term of its original enlistment was three years, but just before the close of the three years' term nearly all the survivors of the regiment re-enlisted to serve during the war. The Sixty-second was attached to the Army of the Potomac, and participated in every campaign of that army. It was always in active field service, from the organization of the Army of the Potomac under General McClellan, until the surrender of Lee at Appomattox. After the corps formation of the Army of the Potomac it was first attached to the Fourth Corps, under General Keyes, and subsequently to the Sixth Corps, under the lamented General Sedgwick. It participated in the following battles during the period of its service, viz. : The Siege of Yorktown, Lee's Mills, Williamsburg, Seven Pines, Fair Oaks, Oak Grove, Savage Station, White Oak Swamp, Malvern Hill, Second Manassas, South Mountain, Antietam, First and Second Battles of Fredericksburg, Marye's Heights, Salem Church, Banks' Ford, Gettysburg, Funkstown, Rappahannock Station, Mine Run, Wilderness, Spotsylvania, Cold Harbor, Monocacy, Fort Stevens, Strasburg, Winchester, Charlestown, Opequon, Fisher's Hill, Cedar Creek, Siege and Fall of Petersburg, Sailor's Creek and Appomattox. Its greatest losses in action occurred at Marye's Heights, The Wilderness, and before Petersburg. During the term of service of the regiment it lost in killed in battle and by death from wounds received in the line of duty, as near as I can gather the facts, 272 men. That number is exclusive of those who were disabled by wounds, which was very large. I cannot get an approximate figure. Lack of space limits this sketch to statements of the most general character relative to the service of the regiment during the war. Reference may be made, however, to two reports from which I make short extracts. These extracts will demonstrate to future generations that the Sixty-second Regiment New York Volunteers faithfully and fearlessly performed its whole duty in the great crisis of the Nation's existence. The following is from Brig. Gen. Frank Wheaton, commanding brigade, in his report of the Second Battle of Fredericksburg, in which he says: "Just before daybreak we reached the enemy's works upon the Heights of Fredericksburg, and were ordered by General Newton to feel them and learn something of the nature of their defences, force, number of guns, etc. I selected the Sixty-second New York, Lieut. Col. T. B. Hamilton commanding, and forming them in line just below the crest, marched up to draw the enemy's fire. Before the regiment was 200 yards from the brigade line, it was opened upon by a heavy musketry fire, and apparently five pieces of artillery from the Rebel works and rifle pits. The Sixty-second New York and One hundred and second Pennsylvania were compelled to fall back a few yards to a line where the slopes afforded them protection from the enemy's fire, and in about as many seconds lost in killed and wounded 64 officers and men. Their conduct is worthy of special praise and notice. The Sixty-second lost its color sergeant, its commander was wounded, and 30 musket balls pierced its flag. "During the Battle of Salem Heights, the Ninety-eighth Pennsylvania and the Sixty-second New York were necessarily left on the south side of the main road, where they performed gallant service under the officer in charge of that portion of the line. They lost heavily, and held their position to the last." General Wheaton, in closing his report of that battle, said: "It was impossible for the gallant little band, forty-five in number, of the Sixty-second New York Volunteers, under Lieutenants Morris and Stewart, to escape capture. Their fire as skirmishers on the advancing enemy delayed his movements and necessitated a more careful reconnaissance which took time, and in my opinion the time thus gained, saved the right of the Second Division and my own brigade from capture." Col. David J. Nevin, who took command of the regiment after the death of Colonel Riker, at the Battle of Fair Oaks, Va., in his report of the service of the regiment in that battle, and the manner in which they received and delivered their fire, concluded his reference as follows: "My men behaved bravely, and while they act so nobly, I have no fear for the cause in which they are engaged." 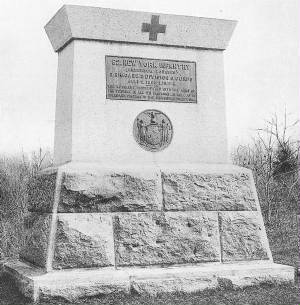 Like commendations of the service of this regiment in other battles of the war could be quoted, but enough has been presented here to satisfy the citizens of our great State that the men who composed the Sixty-second Regiment New York Volunteers rendered gallant service to the Empire State and deserved well the monument erected in their honor. The "Congressional Medal of Honor" was won and awarded to the following members of the regiment for special gallantry upon the battlefield: Edward Browne, James Evans, and Charles E. Morse. Many acts of greater gallantry by members of the Sixty-second might be pointed to at periods of great emergency and danger, which were probably unnoticed at the time by those who had the power to invoke our superior officers to give them deserved recognition. Source: Final Report on the Battlefield of Gettysburg: New York at Gettysburg (1902) New York Monuments Commission for the Battlefields of Gettysburg and Chattanooga. Albany, NY: J.B. Lyon Company.